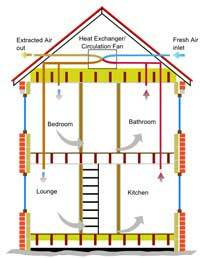 One option to provide domestic ventilation is the use of a Mechanical Ventilation with Heat Recovery system (MVHR). Apart from the potential for recovering heat from the air being expelled, a MVHR system has the advantage that the rate of air changes is fairly constant and does not vary depending on outside wind speeds or direction. MVHR systems are designed to continuously remove small amounts of air from within a building and introduce fresh at the same time; the Heat Recovery part of the description consists of a high efficiency heat exchange with can recover 70-90% of the heat in the extracted air and use this to heat the fresh incoming air. Because a Mechanical Ventilation with Heat Recovery system involved the installation of ducting to every room and needs the building to be very airtight, it is really only practical to install it in a new build or during a major refurbishment. Apart from the ducting, the system includes a single unit which contains the heat exchanger and circulation fans - this is usually installed on the roof space, if one is available, but it is small enough to be fitted in a cupboard in the eaves if the house has rooms in the roof. The controls are very simple, generally consisting of just a speed control for the fans - if you have a party with lots of people, you may want to boost the rate of air changes. Maintenance is fairly simple, usually just needing to drain off any moisture which the heat exchanger removed from the air - but this requires access to the heat exchange/fan unit. If a filter is fitted, this will need to be occasional cleaned or replaced. A well designed Mechanical Ventilation with Heat Recovery system should extract the air from moisture/odour producing areas, such as bathrooms, cloakrooms and kitchens etc. and feed the fresh incoming air into living rooms and bedrooms. This will give a flow through the house preventing moisture and odours from spreading throughout the house. It is essential that the inlet for the fresh and the outlet for the extracted air are kept well apart to avoid the extracted air being drawn back into the house. With the continual forced circulation of air, other forms of ventilation, such as trickle vents in double glazed units are not required; in fact they must be avoided. Using a Mechanical Ventilation with Heat Recovery system also removes the need for individual air extraction from bathrooms, cloakrooms and kitchens etc. Some Heat Recovery systems are designed to fit as a cooker hood. However systems which are not so designed and where a cooker hood is required, need a separate cooker hood (ideally set for recirculation to retain the heat within the building) with built-in grease and carbon filters. Some Mechanical Ventilation with Heat Recovery systems allow for the introduction of a filter to remove particles from the incoming air, this may help people in the house who suffer from hay-fever or have other dust sensitive conditions. The cost effectiveness of a Mechanical Ventilation with Heat Recovery system will depend on its efficiency level, i.e. how much electricity it uses against how much of the heat in the extracted air can be transferred to the fresh air being fed into the house. Really, the heat recovered is only of use during periods when the outside air temperature is lower than that required in the house; however, a Mechanical Ventilation with Heat Recovery system needs to run 12 months of the year as it is ventilating bathrooms, kitchen and cloakrooms etc. where extraction is compulsory. Apart from heat recovery, a Mechanical Ventilation with Heat Recovery system does introduce fresh air into the whole of the house so that even when heat recovery is not important, the quality of the air in the house is improved. 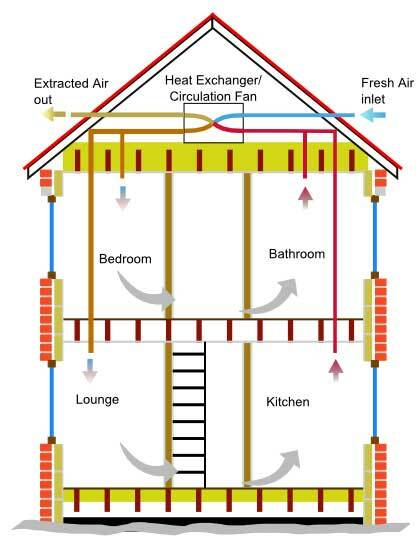 A house being built to modern standard will be well insulated and fairly airtight, so the efficiency and other benefits of a Mechanical Ventilation with Heat Recovery system should be fairly high - however in a older house with less insulation and lots of air leaks with trickle vents and airbricks etc, it will be of little or no benefit.